This week Safe Kids encourages pedestrian safety during ‘Walktober’ and schools across the country participated in International Walk to School Day. As just a sampling, in Katonah students walk, bike to school and a Catonsville school holds Walk to School Day. But even with these efforts, Parents worry about children walking to school, seek crossing guards. 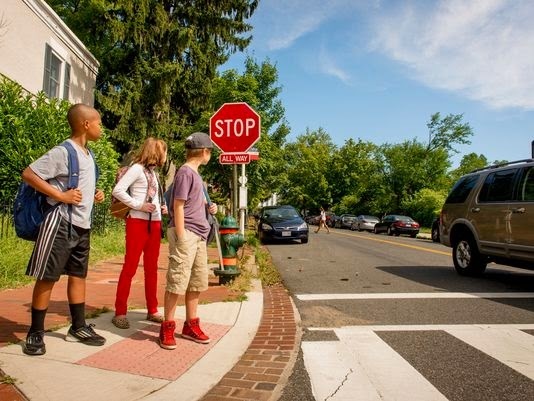 Why can't we Make it safe for our kids to walk or bike to school? They're trying to do that in Glendale, where Projects aim to improve pedestrian, traffic safety in Glendale, and New traffic light aims to improve pedestrian safety in College Park, while Gulch-to-SoBro pedestrian bridge takes big step. Signs make walking Chapel Hill easier and 12 Westchester towns, villages praised for traffic safety--but elsewhere DelDOT Report Shows Pedestrian Safety Problems and Pedestrian crosswalk vandals on the rise. Kind of makes you ask hard questions. Like How safe is Denver for pedestrians? Safer than Detroit, apparently. This week Liberty Mutual releases pedestrian safety study showing Seattle top for pedestrian safety as Detroit comes in last. And New York has its challenges, too. Surviving a Walk in NYC Should Not Depend on Luck. Maybe they should learn What Old Transit Maps Can Teach Us About a City's Future, or take a look at our Capitol, where Progress on Parking Reform Could Make DC More Walkable and Affordable. Stop Talking About Density. Start Talking About Place. While we're at it, we should be Remembering the Human Scale in Walkable City Neighborhoods, although that leads us to wonder: Livable Streets or Tall Buildings? Cities Can Have Both. But can it also have bikes? Chicago Trib Bikelash Writer is Confused About the Real Threat to Pedestrian Safety. Maybe we should be Putting 'Walkable City' to the test.